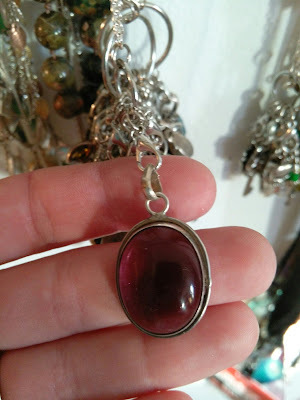 Batty Knits: Organizing Nail Polish and Jewelry! Organizing Nail Polish and Jewelry! I've been going through an organization spree lately. I've also been getting rid of a lot of stuff. Some of the inspiration comes from reading "The Life-Changing Magic of Tidying Up: The Japanese Art of Decluttering and Organizing". I think the author is a bit loony, but she does have some good thought exercises, I just sent 6 boxes of stuff to Goodwill and I've been organizing my stuff better. 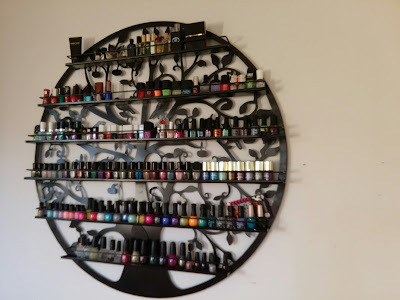 One of my purchases from Amazon (actually is was a birthday gift from my husband) was a gorgeous nail polish rack that hangs on the wall. It stores my nail polishes in an aesthetically pleasing way, AND it makes them easily available. I can see what all I have and easily select what I want to wear. 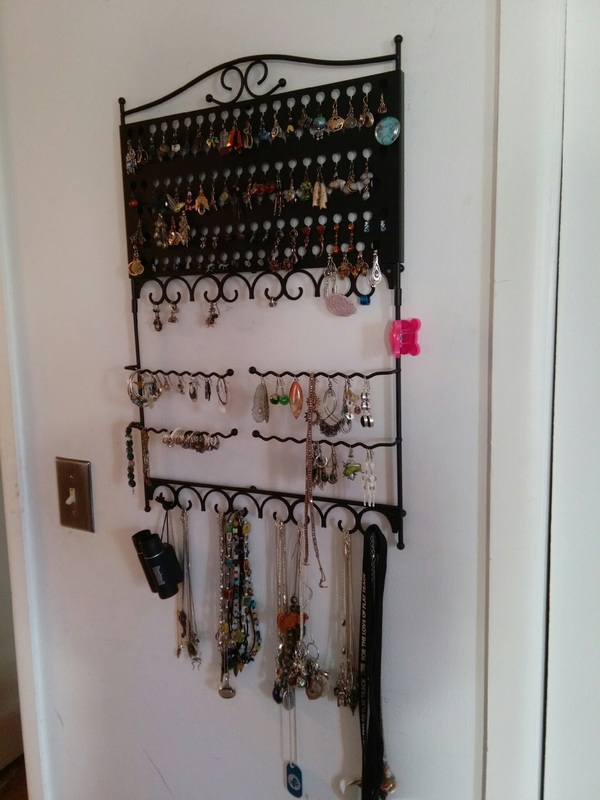 I also recently purchased wall storage for my jewelry (also from Amazon). The same logic applies - aesthetically appealing way to display and organize. It makes it so much easier to pick things out. All of my pendants can hang up on the jewelry rack, and they can each be easily detached to be strung on a chain and worn. 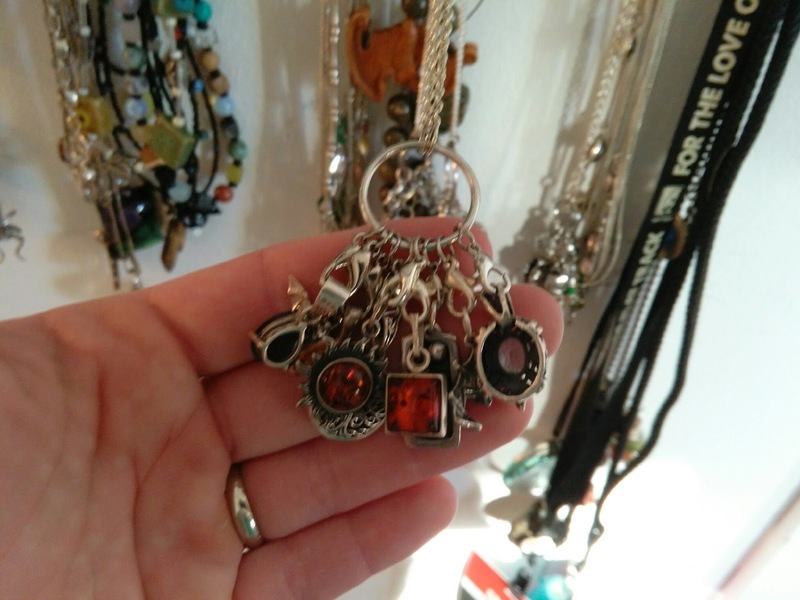 I had so many pendants that I had to make multiples. I'm not sure, but I got this idea from seeing it somewhere on the web. I don't remember where, so I can't credit them. Here's a close-up of one of the pendants showing how easy it is to unclasp the lobster claw to remove it. I'll keep trying to come up with creative ways to store things. Please feel free to share your fun storage and organization projects and ideas! I'm a biology PhD dropout with a strong interest in bat ecology. I really enjoy many different fiber arts including knitting, spinning, and weaving. I also write some of my own knitting patterns, which have been included in a few books - Knits for Nerds, Once Upon a Knit, and Geek Knits. Other hobbies include 3D printing, Raspberry Pi projects, roller derby, reading, gardening, and other miscellaneous crafts that happen to catch my fancy at a given moment. Copyright 2010 Laura Hohman. Awesome Inc. theme. Powered by Blogger.